Going on vacation and so much to pack yet always so little time – and space – to do it. A tip from parents of two - don't forget the kids! More than once we've sat down on a plane, in a restaurant, at the hotel and realized, um, we forgot to pack for the kids. Whether it's a little something to keep them busy or must-have they really can't live without, a little planning always goes a long way. For happier travels, we've put together a list of five top eco-friendly travel gear items for kids – all good for children and the planet too. 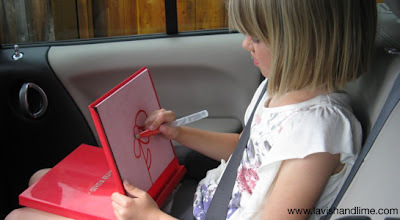 The Water Painting Travel Wizard is a clean, easy way to keep kids occupied during travel. Alcohol-Free Hand Sanitizer 1oz Purse Size - this thyme-based natural hand sanitizer is lab proven to kill 99.9% of germs, without nasty toxins. The alcohol-free formula doesn't dry out sensitive skin and doesn't sting when it comes into contact with small scrapes and scratches. The 1oz/30ml purse size is perfect for little hands to handle and spray all by themselves. Choose from original citrus herb scent or orange vanilla. Buy a six pack and save! 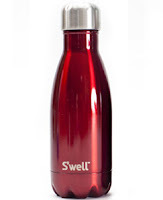 S'well Stainless Steel Insulated Lunchbox Kids Water Bottle - just like the adult size, this smaller 9oz/240ml ergonomically designed reusable water bottle keeps water cold for 24 hours. It's the perfect size for small hands to handle and holds just enough to quench a little one's thirst on the go. Available in red, blue and pink. Rume Reusable Snack Bags Fuschia Love Elephants - kids always seem to be up for a snack, often it seems at the most inopportune moments which is why we suggest keeping a few favourite crackers, cookies, grapes or carrot sticks to hand in a BPA-free reusable baggie. Zippered, washable, food safe tested, these bags are so easy – simply rinse and go between snacks then pop in the washing machine every so often. Assorted styles and colours available. Water Wizard Water Painting Travel Buddha Board - toxin-free, no mess and easy to use, all you need is water to make this creative activity work on the go. Fill the pen with water, unfold the laptop board and your child can let loose his or her imagination. 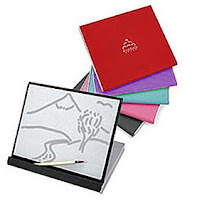 Purse size mini water painting buddha boards with a brush also available and ideal for bringing to restaurants. Sweet Treats & Pirate Kids Envirosax Reusable Bags - new for Summer 2012 from Envirosax are two new reusable bag designs featuring familiar graphics kids love. These handy water resistant bags feature reinforced seams and toxin-free inks. Each one can carry the equivalent of two plastic bags full of groceries yet folds down to the size of a piece of sushi. Ideal for packing all of the above with plenty of room to spare for anything else your child wants to have to hand on the trip.